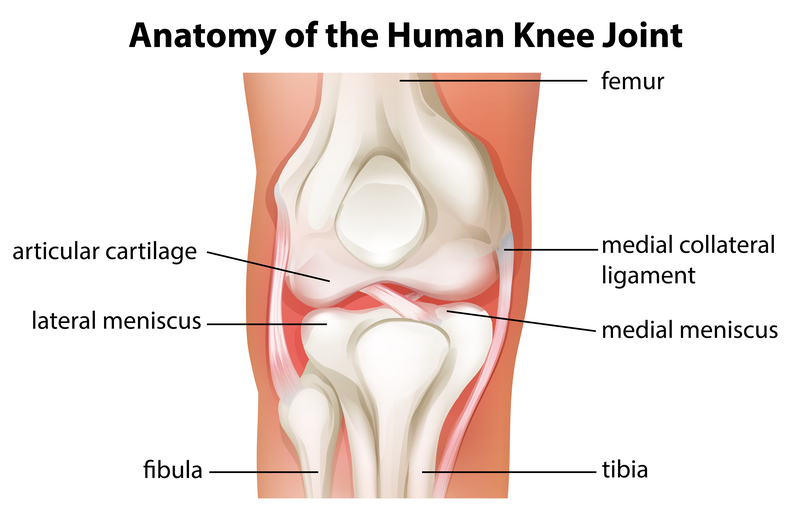 The knee is one of the largest and most complex joints in your body. It’s comprised of bones, cartilage, ligaments and tendons. Two major bones meet to form the joint: the femur (thighbone) and tibia (shinbone). The fibula is located alongside the tibia on the back of the knee, and a fourth small bone, the patella or kneecap, rests on the front to help protect the joint. In between the femur and tibia are two wedge-shaped sections of tough, rubbery cartilage, the menisci, which act as shock absorbers. Four rope-like ligaments hold the bones together and stabilize the knee. 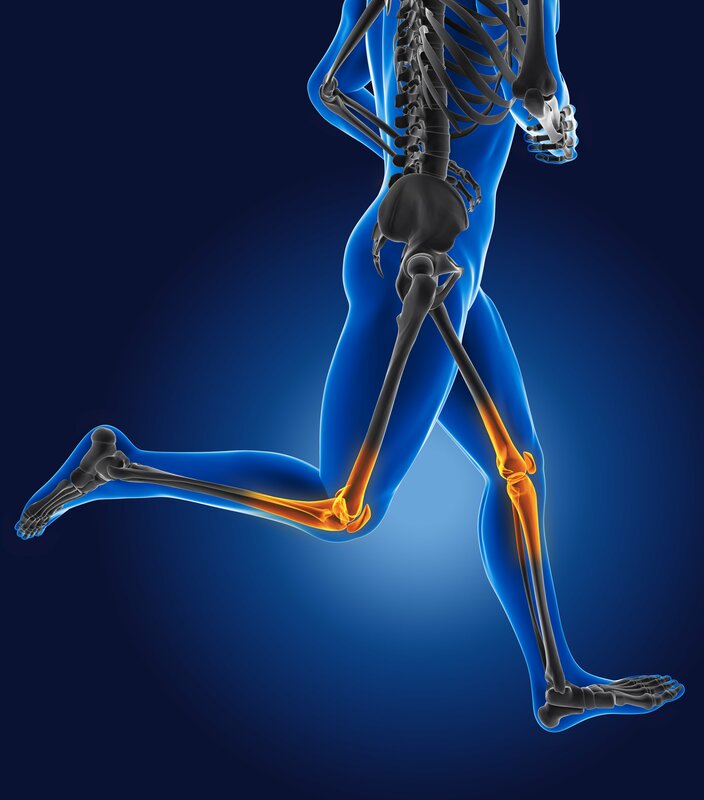 Tendons connect the upper and lower leg muscles to the bones to facilitate joint movement. In addition to bending, your knee is designed move side to side, push, twist and withstand significant pressure. Its complexity and location leave the joint vulnerable to injuries, which can happen if a knee receives a direct blow, is twisted beyond its tolerance, gets landed on in a fall, or is simply overused. Here are some of the most common types of knee injuries, along with their symptoms and usual treatments. 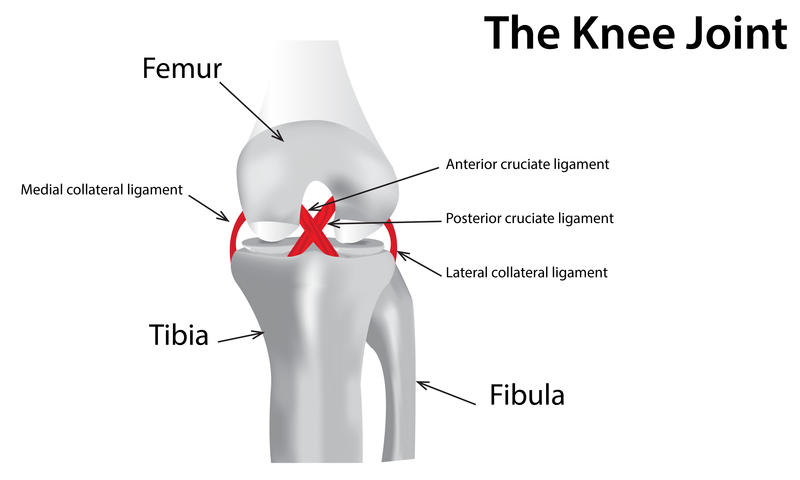 The tough, thick ligaments that stabilize the knee are the medial collateral ligament (MCL) along the outside, the lateral collateral ligament (LCL) along the inside, and two cruciate ligaments that form an “x” in the center of the joint. In the wrong circumstances, these ligaments can become sprained by being stretched, partially ruptured or completely torn. — A blow to either side of the knee while your leg is stretched out can injure the MCL or LCL. Symptoms can include pain on the affected side of the knee, joint instability and difficulty walking. Often, little swelling occurs when these ligaments are injured. Rest, compression, icing and elevation are often the recommended treatments for these knee injuries, along with immobilizing and stabilizing the joint with a removable splint. Healing from minor or moderate damage may take a few weeks. The need for surgery and a prolonged long recovery time are only likely when multiple ligaments and other structures of the joint are damaged. — Stretching or tearing the anterior cruciate ligament (ACL) can happen during a fall, or by simply landing on your leg and then twisting or pivoting the knee. Injuries to the wider posterior cruciate ligament (PCL) are less common, and they’re often the result of a violent impact, such as your knee hitting the dashboard in a car accident. 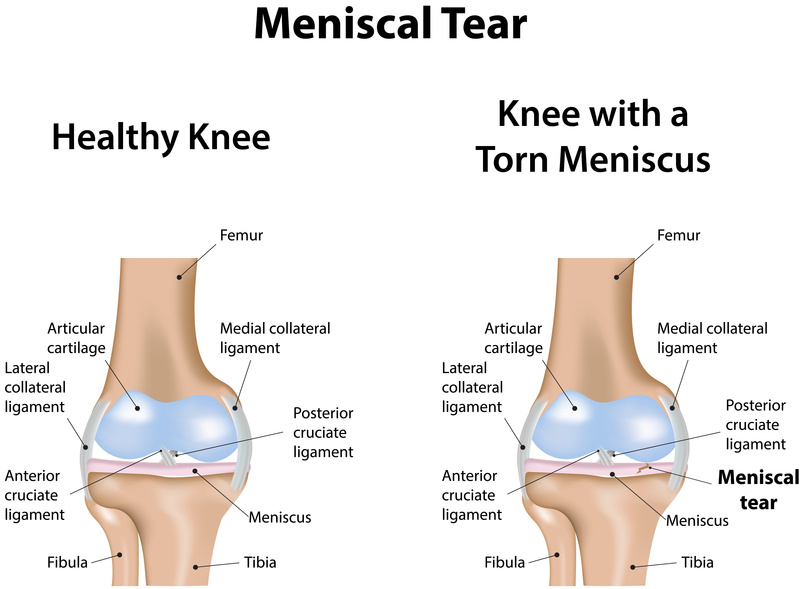 With both of these types of knee injuries, swelling occurs rapidly, and bending the joint is painful and very difficult. Anti-inflammatory medications, icing, compression, rest and elevation are typically used as initial treatments. Depending on the severity of the injury, surgery and/or physical therapy may also be necessary. Returning to full functionality after an ACL or PCL injury can take several months. The knee is extended and flexed by two main thigh muscle groups: the quadriceps on the front of the leg, and the hamstrings on the back. The strong, elastic tendons that attach the leg muscles to the bones include the quadriceps and patellar tendons on the front, and the hamstring tendon on the back. There are various types of muscle and tendon injuries that affect the knee. — Muscle contusions and tears known as strains can be caused by overuse, sudden twisting or an impact, resulting in pain, swelling and stiffness. Minor strains tend to heal quickly with rest, icing, elevation and the use of an anti-inflammatory/pain reliever. More serious injuries can also require compression with a knee sleeve and physical therapy. While these strains may take longer to heal, surgery is rarely needed. — Over-flexing or overextending the knee can result in torn or detached tendons. If a tendon tears, you’ll experience swelling and pain when you attempt to flex or extend the knee. If trauma causes a tendon to detach from the bone, you may feel a sudden, noticable “snap.” You’ll also suffer pain, and a loss of stability and normal movement in bending or straightening the leg. In order for a partially torn tendon to heal, it’s typically necessary to completely immobilize the knee in a brace or cast for several weeks. A completely torn tendon requires surgical reattachment, followed by a longer recovery period. With both these types of knee injuries, physical therapy is often necessary to restore flexibility and strength in your knee and leg. Hyper-flexing or severely twisting your knee can pinch and tear the C-shaped cartilage pads, or menisci, located between the thigh and shin bones. After a cartilage tear, you’ll have pain and swelling that develops relatively slowly over a number of hours. You may notice popping in the knee, and it can also buckle unexpectedly. If the injury isn’t treated, these symptoms can continue intermittently, usually when you’re climbing stairs or walking uphill. Once a cartilage tear is diagnosed, physical therapy is often recommended to strengthen the muscles and stabilize the joint. If the symptoms don’t subside, surgery may be necessary to repair the torn cartilage. — Bursitis, which is painful inflammation of the fluid-filled bursa sacs around the knee that cushion and lubricate the joint. — Plica syndrome, where a thickened or folded inner knee ligament becomes irritated and inflamed. — Patellofemoral syndrome, which causes pain in the front of the knee when it’s bent. — Iliotibial band syndrome, where the fibrous band of tissue running along the outside of the thigh becomes irritated, causing pain in the outer knee. — Tendinitis, which is painful irritation or inflammation of the tendons of the knee. 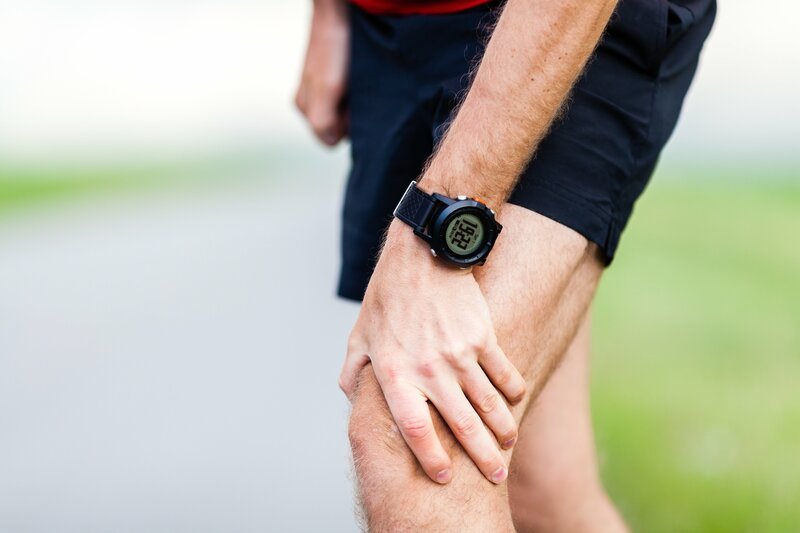 Most often, overuse injuries are managed or resolved by resting and elevating the knee, applying ice and taking anti-inflammatory medications. Physical therapy or steroid injections are recommended with some injuries, and surgery may be necessary in certain instances. Knee injuries that result in bone fractures are typically caused by acute trauma or a severe blow directly to the joint. Bone fractures are usually accompanied by considerable pain, moderate to severe swelling, bruising, and an inability to bend the knee or put weight on the affected leg. 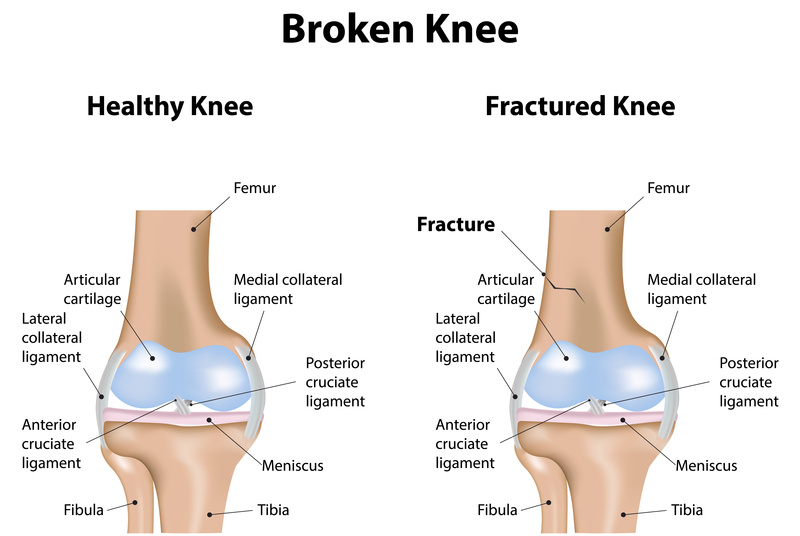 — The most common type of knee fracture affects the patella, and the injury is often caused by a fall and landing on the bone. A minor fracture of the kneecap may be treated by immobilizing the joint with a cast for several weeks. If the patella is dislocated, a surgical repair and follow-up physical therapy become necessary, and a longer recovery period can be expected. — Fractures of your femur or tibia can result from impact during an auto accident, a serious blow to the joint when playing a contact sport, or a fall from an extreme height. These fractures can also occur in elderly individuals with thin bones or degenerative diseases such as osteoporosis. The fractured bone(s) may be dislocated, or even break through the skin. In many cases, these traumatic knee injuries damage nerves, blood vessels, ligaments and tendons as well. Once the extent of the damage is determined, surgery is usual, and it may involve the placement of screws, wires, plates or rods to repair shattered bones and stabilize the knee. Physical therapy is often necessary to restore function, and depending on the severity of the injury, recovery can take weeks or months.